Known also as the Morgantown Expressway, Interstate 176 is a spur from I-76 / Pennsylvania Turnpike north to U.S. 422 on the outskirts of Reading. The freeway replaced Pennsylvania 10 and U.S. 122 as the main route between the Turnpike at Morgantown and the city of Reading. Alternatively known as the Reading Spur, the Morgantown Expressway was first proposed in 1957.1 Numbered Interstate 180, as the Pennsylvania Turnpike was designated as Interstate 80S at the time, the first contract for the freeway was awarded on August 17, 1960. It covered the 3.61-mile stretch of I-180 between Green Hills Lake and the Reading Bypass (U.S. 422).2 Costing $9 million to build, the Morgantown Expressway was dedicated on October 23, 1962 by Governor David L. Lawrence in a ribbon cutting ceremony.1. Completion of the route led to the 1963 decommissioning of U.S. 122, which followed a parallel course through Berks County. Initial work on the Morgantown Connector focused on replacing the original Morgantown Interchange at PA 10 with a new trumpet interchange and access road located 1.5 miles to the northeast. 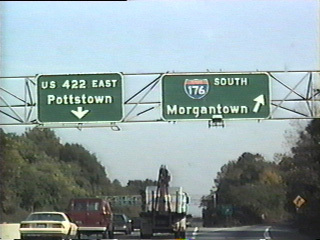 This $17-million project was completed by November 1990.5 Costing $18.5 million, construction on the remainder of the two mile long Morgantown Connector commenced in 1994 and was completed on September 27, 1996.4 The former roadway of I-176 extending south to West Main Street was retained and numbered as Exit 2. Original button copy signs on U.S. 422 eastbound at Interstate 176 south. These were replaced by the late 1990s. Vidcap taken 09/93. Speed limits along Interstate 176 were posted at 65 miles per hour from 19668 until November 30, 1973, when the national 55 mile per hour limit was imposed.9 All signage along Interstate 176 was replaced by Summer 2000. An end sign for I-476 stands ahead of the diamond interchange (Exit 10) with PA 724 to the boroughs of Shillington and Birdsboro. Photo taken 06/24/12. A second I-476 end sign sign precedes Exit 10 at Ridgewood next to Gibraltar Hill. Photo taken 06/24/12. Interstate 176 extends a half mile north from PA 724 onto Poplar Neck along the Susquehanna River. PA 724 parallels the river to the south while U.S. 422 follows the West Shore Bypass east to Exeter Township to the north. Photo taken 06/24/12. A Clearview-font based sign replaced this diagrammatic overhead for U.S. 422 at the Norfolk Southern Railroad underpass by 2011. The new sign still omits Exits 11A/B. Photo taken 06/24/12. Interstate 176 northbound concludes at a trumpet interchange with U.S. 422 east to Pottstown (Exit 11A) and west into the city of Reading (Exit 11B). Photo taken 06/24/12. The previous 2.5 mile end sign for I-476 was carbon copied. Photo taken by Jason Ilyes (05/22/02). Neversink Mountain rises to the north of the Schuylkill River and the exchange (Exit 11) with U.S. 422. These overheads were replaced with Clearview font by 2016. Photo taken by Jason Ilyes (05/22/02). U.S. 422 (West Shore Bypass) crosses the Schuylkill Expressway ahead of the trumpet interchange with Interstate 176 (Morgantown Expressway) south. Overheads here were replaced in 2016/2017. Photo taken 07/28/00. Interstate 176 shifts southeast onto the Morgantown Connector ahead of a parclo interchange (Exit 1) with PA 10 and the trumpet interchange with the Pennsylvania Turnpike. Photo taken 08/01/04. Exit 1 departs I-176 south for PA 10 south into Morgantown and north along old U.S. 122 to Joanna Furnance and Beckersville. A toll plaza follows for the Pennsylvania Turnpike west to Harrisburg and east to Philadelphia. Photo taken 08/01/04. Interstate 76 (Pennsylvania Turnpike) navigates between Welsh Mountain and the borough of Elverson on the approach to the Morgantown Interchange with I-176 north to PA 10. Photo taken 10/15/04. I-76 passes by big box retail stores, a manufacturing plant and town home communities leading into the trumpet interchange (Exit 298) with Interstate 176 and Pennsylvania 10 north to Reading. Photo taken 10/15/04. I-76 (Pennsylvania Turnpike) bends southeast through Caernarvon Township two miles ahead of the Morgantown Interchange with Interstate 176 and Pennsylvania 10. Photo taken by Chris and Amber Lokken (06/24/08). Interstate 176 connects I-76 with PA 10 just north of the Pennsylvania Turnpike at Morgantown. The original freeway spur south to PA 10/23 spans the toll road one mile ahead of Exit 298. PA 23 leads northeast to Hopewell Furnace National Historical Site adjacent to French Creek State Park. Photo taken by Chris and Amber Lokken (06/24/08). The former trumpet interchange (Exit 22) joining the Pennsylvania Turnpike with PA 10 (Morgantown Road) directly was located just west of Exit 298. Photo taken by Chris and Amber Lokken (06/24/08). Interstate 176 (Morgantown Expressway) travels north through Robeson Township toward Reading. Pennsylvania 10 parallels the freeway on the old alignment of U.S. 122 north to Downtown Reading. The state route leads south from Morgantown to U.S. 30 near Parkesburg and U.S. 1 near Oxford. Nearby Pennsylvania 23 travels southwest to Lancaster and east to Phoenixville. Photo taken by Chris and Amber Lokken (06/24/08). “Governor Officially Opens Morgantown Expressway.” Reading Eagle (PA), October 23, 1962. “First Expressway Contract Awarded.” Reading Eagle (PA), August 17, 1960. “Morgantown interchange plans weighed.” Reading Eagle (PA), September 13, 1984. “Morgantown Connector to open today.” Reading Eagle (PA), September 27, 1996. “Route 10 access limited.” Reading Eagle (PA), February 28, 1989. “Highway Department at Fault in Failure to Improve Route 10.” Reading Eagle (PA), January 23, 1968. “Berks Needs new Route 10 Southward and Before State Rebuilds Route 23.” Reading Eagle (PA), December 8, 1968. “Morgantown Expressway To Get 65 M.P.H. Limit.” Reading Eagle (PA), July 25, 1966. “Speed Signs Altered.” Reading Eagle (PA), November 30, 1973.